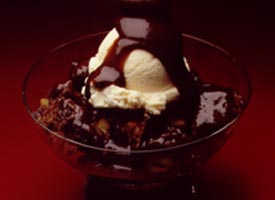 A warm, delicious way to enjoy a hot fudge sundae! Go ahead and add ice cream for a homemade parlor treat. Mix flour, granulated sugar, 2 tablespoons cocoa, the baking powder and salt in ungreased square pan, 9x9x3 inches. Mix in milk, oil and vanilla with fork until smooth. Stir in nuts. Spread in pan. Step-by-step instructions: make your own ice cream.